There’s a major storm coming, and it’s going to affect Fortnite. Players are gearing up for another major event, according to messages on in-game TVs in residential areas like Tilted Towers and Shifty Shafts. As hinted at via 7.20 update leaks on Tuesday, the entire arena is now under a Weather Warning. This suggests the highly anticipated Ice Storm sphere event may be happening sooner than anticipated. And so, Fortnite fans are going wild! Speculation started swirling Tuesday morning when players discovered a mysterious sphere hovering around Polar Peak. After a few hours of data mining, clever fans unearthed evidence of an event called Mooney, complete with animations and sound effects of the sphere breaking. When the audio was run through a spectrogram, it revealed an image of the Ice King. The head of the Ice King has been heavily featured in Season 7 imagery since the Battle Pass dropped in December, and now he’s finally starting to make his presence known. 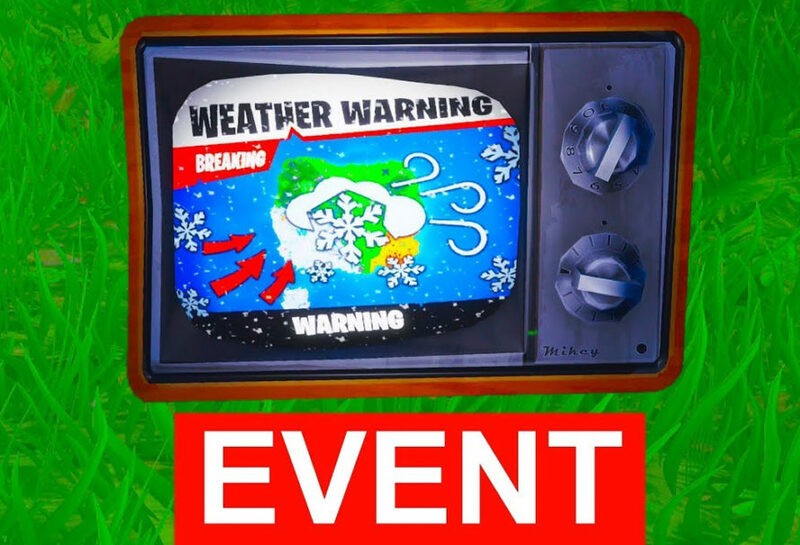 As of now the Weather Warning message is the only in-game clue for the event, but leakers have already revealed a portion of what will happen. Taking a closer look at the Polar Peak sphere, we see that the Ice King himself is actually standing inside it. He’s holding a glowing orb that will presumably be used to cover the entire Battle Royale map in snow. There will also be a set of Ice Storm challenges where players must kill Ice Legion enemies with various weapons to unlock a special Glider and wrap. Most Fortnite Battle Royale fans know this isn’t the first time in-game TVs have been used to generate hype for an upcoming event. Back in April, warning messages hinted at upcoming meteor strikes around Tilted Towers. This Ice Storm event will presumably have very different ramifications, but the tactics to alert players of its existence have been used before. We’re HustleTweeting about Fortnite, and you’re more than welcome to join the conversation on the Hustle Twitter HERE and also on our hyper-interactive Facebook page HERE!